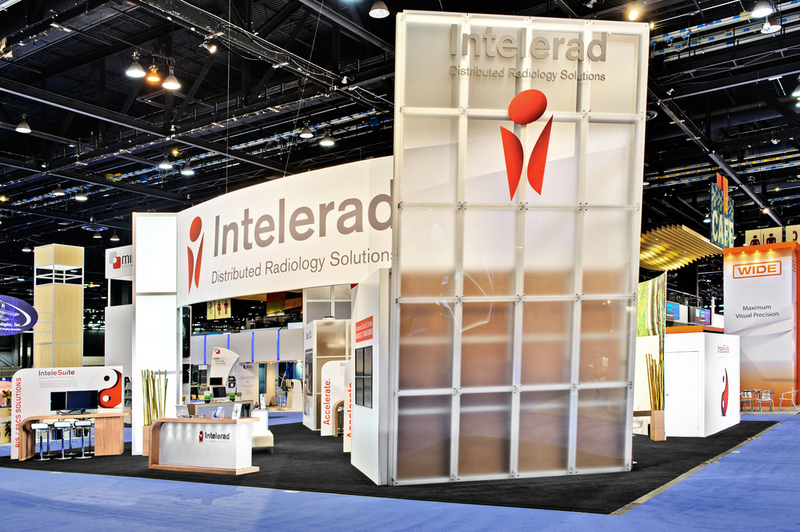 Intelerad Case Study — Exhibit Solutions Inc.
Over the years, Intelerad has grown as an organization and so has their exhibit. One constant has always been their need for a flexible exhibit to adapt to different booth sizes and layouts. As a diagnostic imaging solutions provider, their rental exhibit would have to support their vision of service, product and value. It would have to facilitate meetings with clients, provide areas for one-on-one or group product demos and, of course, accommodate product messaging and corporate branding. The exhibit needed to be impressive, and we also had to provide logistical support for all their shows. In order to support their continued growth and need for different booth sizes, we decided on a custom-designed rental exhibit. We combined modular rental components with carefully selected custom materials to give them the flexibility and look they wanted. To optimize the environment for their software presentations, we incorporated a series of demo stations, a convertible lounge-to-lecture area and a large storage room. For product messaging, we made sure the exhibit design included large graphics throughout the booth. We also took care of all the show service orders, logistics, installation, dismantling and sent a dedicated supervisor for the duration of the show. The rental system supports a wide variety of component combinations to satisfy movement and change within different areas of the booth from show to show. They were especially pleased when we were able to reuse existing components of this original design for a 20' x 20' show. A custom rental exhibit, personal service and a quality product helps RSNA continue to be a successful show for Intelerad year after year. They recently won an industry design award in their booth's size category. We captured immediate attention with eye-level, integrated graphics. The brand stand out from across the show ﬂoor with a vibrant, 16’ x 16’ fabric tower. We designed and crafted modern, soundproof meeting rooms, creating comfortable, private environments for attendees and exhibitors. The flexible nature of our materials allows our workstations to be reconfigured for product demos or special presentations from one show to the next.